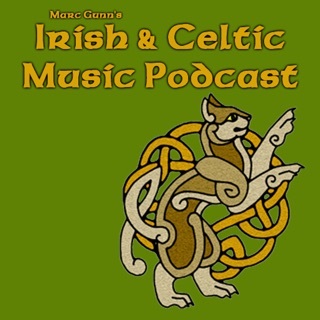 Tune your chanter and drones on your pipes. Free and fully functional, with the in-application option to purchase an unlock for advanced features. Braw Bagpipe Tuner has been written specifically for the tonal and tuning requirements of the Bagpipes, and uses highly advanced pitch detection algorithms which have been further customized for the pipes. 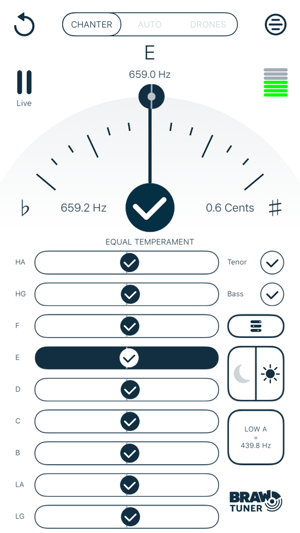 Thanks to our new QuantumNote technology, the Braw Bagpipe Tuner revolutionizes tuning with it's ability to quickly and accurately analyse the tuning of all notes on your chanter while you are playing a tune. This is far superior to all other tuning methods, which rely on holding a single note, as even the best players will adjust their blowing slightly when holding a single note. Our QuantumNote technology allows you to analyse the tuning when it matters the most - when you are playing! 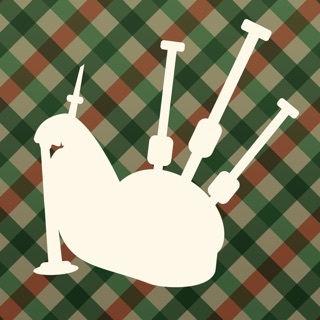 Using QuantumNote, the app is aware of bagpipe ornamentation, and even uses this knowledge to help build an accurate tuning result. * Tune chanter while playing - great for going round the members of a band and checking the tuning without stopping the practice! 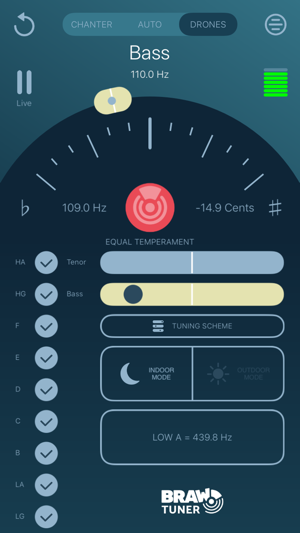 The tuner is responsive, accurate and precise. It it also written to be efficient, so you don't need and expensive phone or tablet to be able to run it. The efficiency also means it has relatively low battery consumption. To suit your preference, different chanter tuning schemes can be chosen. An optional high contrast theme can be set for outdoor use. We genuinely welcome feedback, and in particular if you have any problems please don't hesitate to get in touch, either through the app, or via our website. Braw Bagpipe Tuner was previously know as Accord Bagpipe Tuner. A big update to improve the look and feel. The underlying engine and features are the same, but the graphics have been updated by a professional designer. 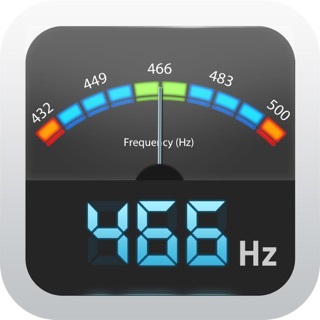 We have also added a volume meter, and an optional high contrast theme for use outdoors. 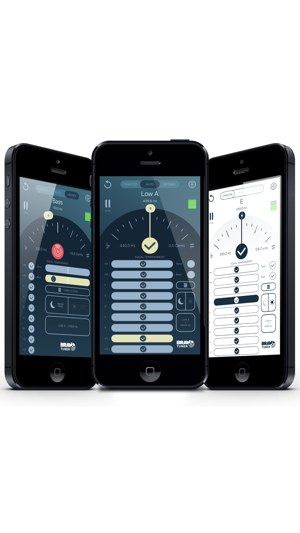 Unless you really enjoy spending a lot of time tuning your pipe, the premium version of this app ($30) is for you. It repeatedly samples all of the notes as you play (single notes also possible) and then ‘fader bars’ which indicate a rolling average of the pitch hold the last minimum or maximum average for each note simultaneously, allowing you to study the visual display and determine how to adjust each out of tune note at a single glance. It’s still an iterative process, but easily 10 times faster and ultimately more precise than other tuning methods I’ve used. And - the scale can be tempered, with the great highland pipe scale the default, but others available. 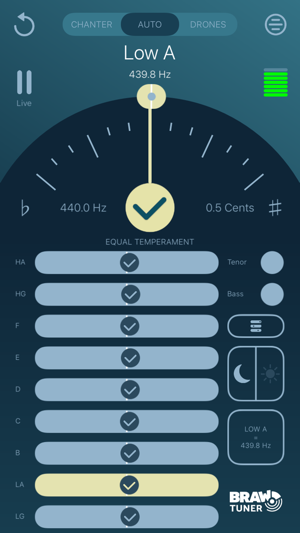 No more trying to guess from a more primitive tuner if low and high Gs are appropriately flat relative to concert pitch; when the Braw tuner indicates that Gs are in tune, the tempering has already taken that into account. I think it’s one of the most effective piping accessories I’ve ever bought, and that $30 for the full app is a bargain in light of the time saved, frustration averted and excellent tuning results achieved. Highly recommended. Read the Description carefully about free and “fully functional with in app purchase”. There is no real deception here in the description if you read the description. It states “Free” and fully functional with in app purchased. So basically the free is a trail version and will be fully functional once you give up $30. In the free version, when you look at the notes half of them are “X” out and don’t appear to be functional. It might be good for the $30, I’m not taking the chance and paying $30 for this app. Seems to be quite advanced with an averaged readout of tuning, however, to do something as basic as set reference A to 440, it asks for a $30 upgrade fee. Back to normal tuners for me, I think.